Exciting news! We are having an AFCC Book Club! 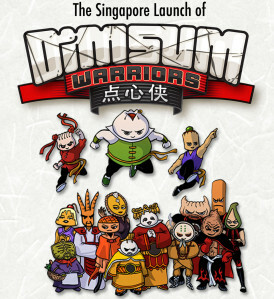 The Arts House, the National Book Development Council of Singapore and the Asian Festival of Children’s Content Book Club present The Singapore Launch of DIM SUM WARRIORS 点心侠. After creating the satirical website TalkingCock.com and winning international awards for their movie Singapore Dreaming, the husband-and-wife creative team of Colin Goh & Woo Yen Yen have a brand new project - DIM SUM WARRIORS, a critically-acclaimed comic series for the iPad that also supports the learning of Chinese and English! FREE ADMISSION – Kids Welcome! Colin Goh and Woo Yen Yen are the husband-and-wife creative team behind Dim Sum Warriors, the critically-acclaimed comic app for the iPad that also supports the learning of English and Chinese. Together, they also founded the satirical website TalkingCock.com, and made the movie Singapore Dreaming, which won the prestigious Montblanc New Screenwriters Award at the San Sebastian International Film Festival, and the Best Asian Film Award at the Tokyo International Film Festival, and has even been screened at the Smithsonian Institution. A former lawyer, Colin has been cartooning professionally for over 20 years. He also recently ended a well-regarded column for the Straits Times and continues to write the highly popular Last Page for 8Days. Recently, he illustrated the New York Times international bestseller ‘Search Inside Yourself’ by Google’s Chade-Meng Tan. Yen Yen received her doctorate in education from Columbia University’s Teachers College in New York, where she was awarded the prestigious Spencer Research Fellowship. She is now an Associate Professor at Long Island University’s College of Education and Information Sciences, teaching courses in curriculum development and the social foundations of education. She has also worked as an education consultant and an instructional designer for an education software company.